In Ketchum, “pop-up” galleries are giving some less-well-known artists a chance to show and sell their work. They are also filling otherwise empty walls with local inspiration. From Bellevue to Sun Valley, there are hundreds of artists working in the Wood River Valley. Not all of them show their work locally. Some are more well-known outside of this area. Many local artists would love to be represented by a gallery, but do not create enough art of a certain kind to have their work shown. Sotheby’s Realty, at 291 North Main St., began showing local artists in 2010, beginning with painter Mary Stratton and photographer Tal Roberts. “They both sold work,” said Sotheby’s marketing director Sarah Keefer. Those artists have included painters Tessa Bradley and Mark Kashino, and most recently, Susan Perine. Bellevue metal worker Mark Sheehan will show work at Sotheby’s this summer. Sotheby’s takes no sales commissions, and provides snacks and beverages during gallery walks. “Our [real estate] clients do enjoy seeing the art on the walls,” Keefer said. L’Anne Gilman, the owner of Gilman Contemporary gallery on Sun Valley Road, said she welcomes the diversity that pop-up galleries bring to town. Gilman said she and other gallery owners have to be “selective and limited” with regard to their listed artists because her staff has to spend a lot of time and resources marketing them. Rau has four pop-up artists showing work in Ketchum businesses, including her husband, painter David Rau. David Rau’s artwork is showing along with the work of photographer Tory Taglio at Gateway Funding mortgage company at 360 Sun Valley Road. The artists use social media to network with one another and attract potential buyers before gallery walks. Hailey resident Alison Higdon is an encaustic painter who has taught classes at the Sun Valley Center for the Arts. 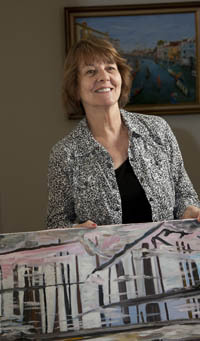 She recently showed her work in Santa Fe, N.M., as part of an international exhibition of encaustic artists. Last week, Higdon was looking in Seattle for an art gallery that would be interested in taking her on. “It’s hard being from Idaho because the state is not usually included in the category for Northwest artists,” Higdon said. Her work is on display at Silver Creek Realty at the corner of Sun Valley Road and Leadville Avenue in Ketchum. Steve Behal and Jeannie Catchpole are also showing at Silver Creek Realty. Higdon said she sold three small pieces at Silver Creek, and one large piece from the walls of Gather yoga studio before that. Thanks to some marketing on her own, she was recently invited to show her work at the Sawtooth Botanical Garden south of Ketchum.